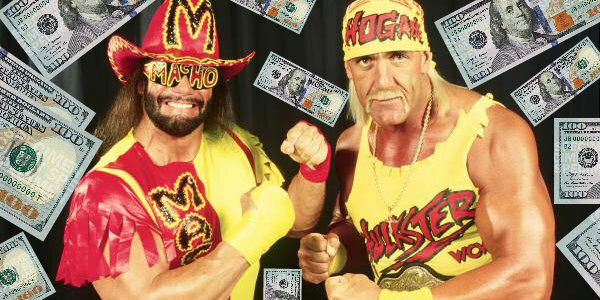 The astronomical earnings of former pro wrestlers in WCW and WWE! Money makes the world go around and that rings true in pro wrestling. Forget fanciful ideas of wrestlers doing it "for the love of the business", that's just a ridiculous work that babyfaces act out. The truth of it is, pro wrestlers are some of the savviest operators in entertainment, they make a hell of a lot of money if they play their career right. Like many of us, they do their job to pay the bills and buy nice things, and they'll use all the backstage politics and tenacious work necessary to achieve those mighty dollar signs. In the history of the business, there's been some guys who made astronomical amounts of money for the level of work they delivered. Sure, you'd expect the Hogan and Cena types to make a bucketload of cash - but there's also been some really average wrestlers who made millions. Drawing upon sources such as the Wrestling Observer Newsletter and Power Slam Magazine, we've compiled a list of former wrestlers with outrageous salaries that you wouldn't believe! For good measure, we've also added a manager and celebrity talent to give perspective on how WWE pays diverse talents. There's no particular order as the salaries and contexts are so varied, so let's get straight to the action! When Steve Austin first signed with WCW in 1991 he made a low $75,000 per a year. However, that was then bumped up to $275,000 in 1994. Austin fell on harder times after WCW let him go and he went to ECW for a short while. He then took a job with the WWF, where he evolved into the Stone Cold phenomenon. He earned over $5 million in 1998 and 1999 as WWF's top star. His ex-wife Debra estimates that he made about $12 million a year on the whole. Given his position at the top of the card and his huge merchandise sales, we can absolutely believe that.